Amps = 40-280 A Wire Range 0.6 - 1.2mm Weight = 60kg 4 Roller Drive Motor Timer = Yes Acessorie.. 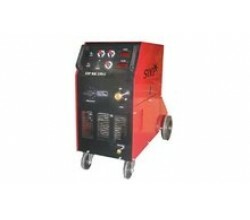 Suitable to automotive and light to medium industrial applications in the workshop or on site. M..
Fuse - 20A Welding Current - 45 - 210A Voltage Steps - 6 Duty Cycle - 15%(210A) 60%(105A) 100%(80.. Input voltage - AC 230V 50/60Hz Input power - 9.4kva Voltage adjustment range - 11-28V Current ra..
Output Amps = 20-200 Amp Duty Cycle -35% = 135 amps Duty Cycle -60% = 100 amps Voltage Steps = 12..
Output Amps = 20-240 Amp Duty Cycle -35% = 180 amps Duty Cycle -60% = 140 amps Voltage Steps = 12..
Output Amps = 30-270 Amp Duty Cycle -35% = 250 amps Duty Cycle -60% = 190 amps Voltage Steps = 16..
Output Amps = 30-330 Amp Duty Cycle -35% = 330 amps Duty Cycle -60% = 250 amps Voltage Steps = 16..
Output Amps = 30-270 Amp Duty Cycle -60% = 190 amps Duty Cycle -45% = 220 amps Voltage Steps = 16..
Output Amps = 30-330 Amp Duty Cycle -60% = 250 amps Duty Cycle -45% = 290 amps Voltage Steps = 16..
Output Amps = 30-410 Amp Duty Cycle -60% = 350 amps Duty Cycle -45% = 400 amps Voltage Steps = 24..